Chelsea say fans who sang an anti-Semitic chant in the Europa League game with MOL Vidi have “shamed the club”. 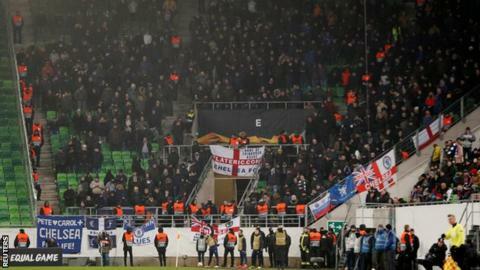 A vocal minority chanted offensive songs about Tottenham fans early in Thursday’s 2-2 draw in Hungary. Uefa said it will await the referee’s report before deciding on whether any action will be taken. Willian and Olivier Giroud scored free-kicks for Chelsea, who had already qualified for the knockout stages, in their draw in Budapest. “Any individuals that can’t summon the brainpower to comprehend this simple message and are found to have shamed the club by used using anti-Semitic or racist words or actions will face the strongest possible action from the club,” the spokesman added. Press Association journalist Matt McGeehan said the chanting could be heard clearly in the stadium. “It was very early in the match,” he told BBC Radio 5 live. “It was a chant that Chelsea supporters have done in the past and it references Tottenham supporters using the ‘y’ word, the anti-Semitic derogatory word about Jewish people. “I understand that Chelsea are angry from the top to the bottom of the club – the very top actually because owner Roman Abramovich is Jewish. On Wednesday, manager Maurizio Sarri condemned “discrimination in any form” following the alleged racist abuse of Manchester City’s Sterling. Chelsea and the Metropolitan Police are investigating the allegations which occurred during the Blues’ Premier League 2-0 win on Saturday. “If you just ban people, you will never change their behaviour,” he said. The club’s Say No to Anti-Semitism scheme, which began in January, also provides one-to-one education courses. A group of 150 people, consisting of Chelsea club staff, stewards and supporters, visited Auschwitz in June to learn about the deaths of more than a million people killed there between 1940 and 1945.